BerniePDX will welcome county commissioner candidates who have completed our questionnaire and been invited to speak. Bring your questions! Find out what their vision of the future is and how they align with your values. An endorsement poll will be sent out after the meeting. Mother, business owner, social justice activist, Co chair of the New Portlanders Policy Commission and dedicated advocate to communities of color. Susheela was born in India, and grew up in Singapore and Indonesia. She came to the United States in 1979, at the age of 16, to attend college. Her parents believed that a good education was the cornerstone of a good life, and they used all of their extra income and savings to make sure Susheela received that education. Susheela is an attorney and a community advocate. As an attorney, Susheela represented the government in taking on corrupt and negligent bank officers during the fiscal crisis of the 1980s, provided free legal services to people seeking political asylum in the U.S., and worked on improving labor conditions at factories in Southeast Asia. As a community advocate, she has supported our public schools; worked to improve access to reproductive healthcare; and has challenged the power structure in our local arts institutions to ensure that public dollars are invested in communities of color. She will bring to the Multnomah County Commission her personal experience as an immigrant, a woman of color, and a mom; and her professional experience moving large institutions to make things better for those with the least power. I’m excited to launch my campaign for County Commissioner, District 2, as a champion of everyday people and those who have been historically left behind, discounted, marginalized, and not represented.We can do better and we will do it together. You can’t lead people or work with people where you haven’t been willing to go yourself, I’m the candidate that has lived in the neighborhood, built the buildings, run the business, housed the homeless, worked with the young adults to achieve brighter futures, given jobs to the overlooked, and reached out to our entire community. Authentic leadership that is not beholden to for-profit interest is what I want to bring to the leadership of Washington County. As someone who has experienced most of the pressing issues in the county, I bring the perspective of not only understanding the issues but a deeper insight that allows me to feel the urgency for a resolution. My key issues that I want to tackle are Affordable housing, County services, and sustainable growth. I believe that investing focus and energy into the things that county citizens need is the best way to keep our community growing at a healthy pace. I envision a future where leadership is there to promote the welfare of the community, leadership that is not bought, and elected leadership that understands that they are the servants to the people’s best interest. Location: Watershed Bldg, 5040 SE Milwaukie Ave.
On Wednesday, February 21st, come out to hear a presentation from Dana Carstensen, progressive candidate running for Metro Council District 4. How does Dana plan to shape policies impacting your lives, including housing, transportation, waste management, and lifting up the voices of historically underserved communities? Will he take corporate money in his campaign? Bring your questions! We will also discuss the HOPE amendment that the Oregon House just passed in favor of universal affordable healthcare in Oregon. Many thanks to each and every one of you who took the time to vote in our endorsement poll. For City Council, we’re proud to endorse Julia DeGraw for Position 2 and Jo Ann Hardesty for Position 3. Julia’s vision for transforming City Council is truly inspiring, we believe it has the potential to really change how politics is done in Portland. Julia combines passion and experience, she has a track record of effective leadership, and with our support she will be a formidable challenger to Nick Fish and to entrenched business interests! 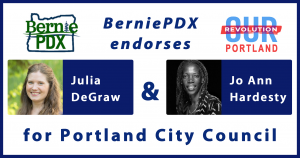 We were very impressed with Andrea’s energy and her detailed grasp of policy and we wish her all the best, however, BerniePDX members chose to throw their support behind Jo Ann Hardesty for City Commissioner, Position 3. Jo Ann has long been one of the strongest voices for justice in our community, and Portland needs the wealth of experience and diverse perspective Jo Ann will bring to the table. 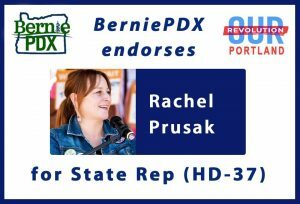 For Oregon HD 37, BerniePDX is proud to endorse Rachel Prusak for State Representative. It’s time to kick out of office Representative Julie Parrish, main architect of Measure 101, and Rachel Prusak is the woman for the job! As a nurse and healthcare advocate, Rachel has too many times witnessed “the tragedy forced upon us by those in power who don’t believe that health care is a human right.” She will bring much needed expertise, compassion and unstoppable determination to the Oregon House.